Porcelain veneers are very thin layers of molded porcelain that cover the front portion of a tooth. They are used to create a perfect smile without significantly altering or replacing tooth structure. Porcelain dental veneers can help create white teeth from very discolored, unbleachable teeth, cover chips, breaks, or spaces, and even help crooked teeth appear perfectly straight. 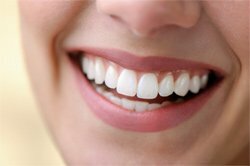 Dental veneers remove as little tooth structure as possible (as opposed to a dental crown, which acts as a cap on an entire tooth), are very aesthetically pleasing, and take only two appointments to place. The alternatives to porcelain veneers are crowns and composite resin bonding. Crowns require more extensive work, and are generally used when a tooth has lost a large portion of its structure or needs to be replaced more completely. Composite resin bonding, on the other hand, is used for insigificant imperfections and generally will be used to fill in very small portions of teeth. Dr. Blackwood uses the new DURAthin prep-less veneers at his Murray practice near Sandy, Utah. A DURAthin tooth veneer is designed to adhere to the front of your tooth without having to remove any enamel! They are generally much thinner than a traditional tooth veneer so they cause dramatically less irritation after application and are easier to adjust to. They are also applied in thin layers which gives them an even more natural color and general look. Having DURAthin dental veneers applied is painless! It’s an easy, less invasive cosmetic dentistry procedure that does not require the removal of any healthy tooth structure and leaves you the option of being able to remove them if you chose to. Porcelain veneers are one of the fastest and painless ways to have a whole new, perfect smile! To set up a tooth veneer consultation with Dr. Clint Blackwood in Murray, UT, please call us or use the contact form to the right if you are in Salt Lake City or Sandy, Utah, and we’ll get in touch as quickly as possible!